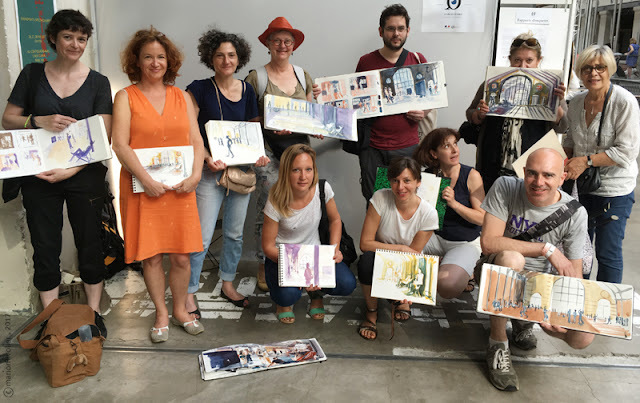 What incredible courses for #usk10x10 in Paris! For two months now, my great team of instructors (Delphine Priollaud, Laurent Bailly, Jérémy Soheylyan et Isabelle Corcket) and I, teach at the event 10 Classes for 10 Years. The last workshop on Medium Stories was about “People having Fun”! I chose the CentQuatre, a wonderful place in Paris with many activities: exhibitions, theater, dance, bookshop, restaurants, etc. This place is always full of people: young dancers and actors, jugglers who are training and always repeating the same movements. Depending on the site schedule, you can come across some strange people; that day, we spoke with a spaceman dressed in aluminum foil and two serious and rigid girls on horseback! The course began with a little warm-up : drawing four ranges of people in lines, in shapes, right hand and left hand! Drawing with the other hand is always wonderful, it is a way to loosen up. For the second part of the workshop, attendees worked on people in action in a small and intimate place. They had to reveal the gesture and corpulence of these bodies by different plastic means: negative space, line, shapes, warm and cool values. How to focus and reveal your subject, how to tell your story with reduced means? How to capture the essence? The last part of the workshop was still focused on bodies in action, but in a bigger place. How to keep your focus on the movement of people while suggesting the architecture of the place? How not to get lost in a multitude of details? It was a great course with a lot of concentration, energy and sweat! Thank you to all attendees! 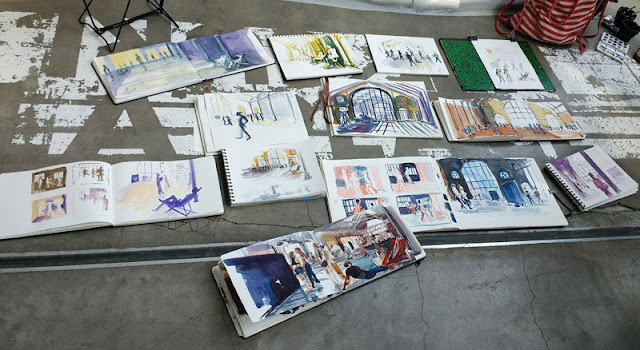 In one week, we will close the Paris Session of #usk10x10 in Notre-Dame with the five instructors and 25 attendees: what is your Lastest Story about Notre-Dame? I hope it will be a great story!